I'm upgrading my old laptop Dell D630 from the CPU T7250 to T9800. After changed the CPU, it's not working at all. The power light turn on for a second and off itself without showing anything on the screen . Do anyone can help me to add the micro code of T9800 into the bios of D630? (06-19-2016, 12:58 AM)DeathBringer Wrote: [ -> ] Post screenshots of first (CPU) & third (Mainboard) tabs of CPU-Z with native CPU. It may confuse you cause the GM/PM965 support FSB 800MHZ only and T7250 also. Yes, I over clock the FSB from 800 to 1066MHZ and it works well , that why I'm looking at T9800 with native FSB 1066MHZ. GM965 doesn't support FSB=1066MHz. So you can T9800 start with FSB=800MHz by BSEL mod and overclock to 1066MHz. (06-19-2016, 02:03 AM)DeathBringer Wrote: [ -> ] GM965 doesn't support FSB=1066MHz. So you can T9800 start with FSB=800MHz by BSEL mod and overclock to 1066MHz. I already over clock the fsb to 1066MHZ , but it does not work at all with T9800 . What I thought is the bios does not include the microcode of T9800. What is BSEL MOD ? Overclocking works after the motherboard recognise native FSB by CPU's BSEL pins. 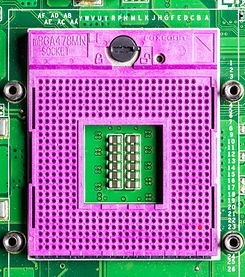 If a combination CPU's BSEL pins of isn't supported then the motherboard don't supplies a power to CPU. To start T9800 you need to isolate BSEL1 pin! I've marked it by red color. I'll add microcode to your BIOS if you successfully make this pin mod. Would you post the picture of how to pin the motherboard again? It's not showed . (06-19-2016, 05:41 AM)yagami7215 Wrote: [ -> ] Would you post the picture of how to pin the motherboard again? It's not showed . Look at the small red point, bottom right corner of the picture. This pin(B23) must be isolated. I cut off the pin B23(bsel) of the CPU , But it still not work. Should I connect this pin to vcc on the M/B? (06-19-2016, 07:31 AM)yagami7215 Wrote: [ -> ] I cut off the pin B23(bsel) of the CPU , But it still not work. Should I connect this pin to vcc on the M/B? Why do not you just isolated this pin?!! Now you can't use this CPU in other laptop! Show a foto of your CPU without this pin.